Emerging contaminants, or contaminants of emerging concern, can refer to many different kinds of chemicals, including medicines, personal care or household cleaning products, lawn care and agricultural products, among others. These chemicals make it into our Nation's lakes and rivers and have a detrimental affect on fish and other aquatic species. That have also been shown to bioaccumulate up the food web - putting even non-aquatic species at risk when they eat contaminated fish. The USGS monitors and assesses these dangerous chemicals from their source all the way through the food web. Since the 1990s studies around the country have investigated how a wide range of chemical compounds, industrial pollutants, and human by-products have been making it into our Nation's waterways. Traditionally, most people were not overly concerned about this because the old mantra used to be "dilution is the solution to pollution" However, this is far from true. After the contaminants make it into the rivers and streams, tests show that there are measurable quantities of these contaminants within the water, itself, as well as in the under-water sediments, the nearby aquatic insects, migratory fish that eat the insects, and even predatory wildlife that consume all these different organisms. Contaminants of emerging concern enter the environment every day. To understand where these chemicals come from, we just need to think about our modern lifestyle. People use chemical-based products each day. These chemicals remain in wastewater and beyond because treatment plants weren't designed to take out these chemicals. Similarly, industrial processes that have their own treatment processes don’t remove all these chemicals, either. Eventually, they end up in the Nation’s lakes and rivers. So these chemicals are getting into the environment and we're concerned about the effects they might be having on organisms, including humans. After all, different contaminants have been detected in drinking water supplies and their risk to our health is still uncertain. USGS studies contaminants and pathogens in nature and provides the science necessary to help protect the health of people and the environment. There are a huge range of water-quality topics related to emerging contaminants. Here are a few select studies that demonstrate USGS capabilities. The application of passive sampling technologies for the monitoring of legacy and emerging organic chemicals in the environment is becoming widely accepted worldwide. Scientists are assessing the impacts of contaminants of emerging concern on Great Lakes fish, wildlife, and water quality by collecting and analyzing samples from tributaries to the Great Lakes. 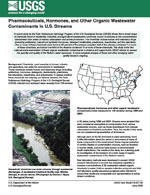 The USGS publishes many reports and informational products on emerging contaminants, here are a few of the more seminal study results. 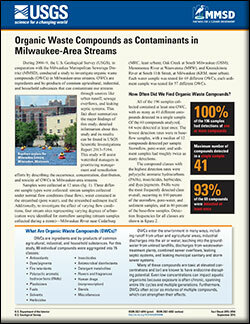 Baldwin, Austin K.; Corsi, Steven R.; Magruder, Christopher; Magruder, Matthew; Bruce, Jennifer L.
Baldwin, A.K., Corsi, S.R., Magruder, Christopher, Magruder, Matthew, and Bruce, J.L., 2015, Organic waste compounds as contaminants in Milwaukee-area streams: U.S. Geological Survey Fact Sheet 2015-3056, 4 p., http://dx.doi.org/10.3133/fs20153056. Kolpin, D.W.; Skopec, M.; Meyer, M.T. ; Furlong, E.T. ; Zaugg, S.D. 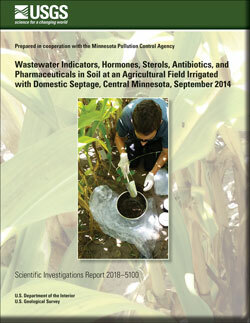 Urban contribution of pharmaceuticals and other organic wastewater contaminants to streams during differing flow conditions; 2004; Article; Journal; Science of the Total Environment; Kolpin, D. W.; Skopec, M.; Meyer, M. T.; Furlong, E. T.; Zaugg, S. D.
Buxton, Herbert T.; Kolpin, Dana W.
Pharmaceuticals, Hormones, and Other Organic Wastewater Contaminants in U.S. Streams; 2002; FS; 027-02; Buxton, Herbert T.; Kolpin, Dana W.
Kolpin, D.W.; Furlong, E.T. ; Meyer, M.T. ; Thurman, E.M.; Zaugg, S.D. ; Barber, L.B. ; Buxton, H.T. Pharmaceuticals, hormones, and other organic wastewater contaminants in U.S. streams, 1999-2000: A national reconnaissance; 2002; Article; Journal; Environmental Science and Technology; Kolpin, D. W.; Furlong, E. T.; Meyer, M. T.; Thurman, E. M.; Zaugg, S. D.; Barber, L. B.; Buxton, H. T.
Here are USGS software products used for emerging contaminant assessments. MODFLOW is the USGS's modular hydrologic model. MODFLOW is considered an international standard for simulating and predicting groundwater conditions and groundwater/surface-water interactions. Click to learn more. Sometimes the USGS produces videos or puts out other imagery to help explain a science topic. Here are a few examples about emerging contaminants. The Senate is holding a hearing on pharmaceuticals in water, and the USGS is supplying information. Herb Buxton, USGS Toxic Substances Hydrology Program Coordinator, fills us in on related research and findings. Here are a few top stories and news articles highlighting USGS science. New research from the U.S. Geological Survey details that even after the storage and/or treatment of leachate – liquid waste that moves through or drains from a landfill − it can still contain a multitude of chemicals and reflects the diverse nature of residential, industrial, and commercial waste discarded into landfills in the United States. Pharmaceutical manufacturing facilities can be a significant source of pharmaceuticals to surface waters, according to a new study by the U.S. Geological Survey (USGS) conducted in cooperation with the State of New York. That morning cup of coffee, the medicines we take, the soaps and shampoos we use, household cleaners, pesticides and a host of chemicals.... What do they have in common? They all eventually end up in the environment. An increasing number of reports are being published regarding the environmental occurrence of trace organic compounds such as pharmaceutical residues, personal care products, and hormones, and their potential adverse effects on aquatic and terrestrial life and human health.